Found in FNA Volume 8. Treatment on page 504. Mentioned on page 372. Plants 5–80 cm, (without multicellular hairs); rootstocks creeping, ± horizontal. Leaf blades white-glaucous or, sometimes, green abaxially, (1–)2–5 cm × 1–8 mm. Pedicels erect or recurved, reddish or pale-glaucous, 6–20 mm. Flowers: sepals valvate in bud, soon wide-spreading, whitish to reddish, especially marginally, 1–1.7 mm, apex blunt to acute, calyx saucer-shaped, without stomata; petals short-spreading or recurved, hairy adaxially, minutely papillate on margins, corolla 5–8 × 3.5–7 mm, without stomata; nectariferous tissue at ovary base; ovary depressed-globose; placentae attached next to summit of columella; style ± equaling corolla tube. Capsules 5-locular, 4–8 × 4–5 mm, deeply depressed apically obscuring style base, conspicuously glaucous when young, glabrous or hairy at base. Seeds brown, ca. 1 mm; testa smooth, lustrous. 2n = 48. 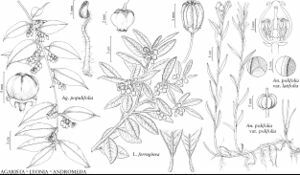 Infection of Andromeda polifolia by species of the ascomycete genus Rhytisma Fries appears to result in leaves broadened and reddish, often not glaucous (A. L. Jacquemart 1998). A hybrid of var. latifolia with var. polifolia [Andromeda ×jamesiana Lepage; A. polifolia var. jamesiana (Lepage) B. Boivin] is known from southern Nunavut and from the James Bay and southern Hudson Bay regions of Ontario and Quebec (J. Cayouette 1986); it is characterized by the abaxial surfaces of leaves being both glaucous and white-puberulent. Other specimens having abaxial surfaces of leaves both glaucous and puberulent are scattered through the range of A. polifolia.